No one has got rich by finding a lost city but there’s a dream hidden there in the mind of all of us. Clearly, the important thing about lost cities is that they’re lost. Once they’re found, the archaeologists take over, and the tour guides won’t be far behind. Another handful of expeditions is setting off this season, as there will be every year forever. There is more chance of hitting the New York State lottery than of finding El Dorado or Paititi but every expeditionary would rather find The City than win the lottery. To discover the unknown past is as good as, and more believable and possible than, seeing and touching a UFO. Show us the man who can prove that El Dorado and UFOs don’t exist! Peru has been supplying genuine lost cities not just way back when, like Turkey or China, but this century -Machu Picchu to begin with and more recently Pajaten and Espiritu Pampa in the mid-60s and Gran Vilaya just 10 years ago. From the 1980s, too, came Sipan, the startling, rich pyramid, which for these purposes qualifies as a city, hidden not behind the Andes in impenetrable jungle as required by lost city lore but out in the open desert not far from the Pan-American Highway. But coastal sites like Sipan are mostly produced by archaeologists, in this case Walter Alva, a dedicated, persistent scientist who thoroughly deserved his success. But archaeologists are trained to keep their noses to the ground, preferably below ground. Their grasp of the nitty-gritty doesn’t allow them to see the wood for the trees. So they rarely find the genuine Lost Cities out in the bush and actually they hardly even go looking for them. It wouldn’t be scientific. The real thing is invariably searched for and found by people who act like, and sometimes even look like Harrison Ford. They include, in the case of Peru this century, Senator Hiram Bingham, Colonel Percy Fawcett, Gene Savoy and Robert Nichols. A handful of others, including Vincent Lee, Robert Randall and Yoshiharu Sekino have also been prominent in looking hard, scratching the surface of the Amazonian flanks of the Andes. Bingham and Savoy both survived their adventures and went on to become well-known and established in their own country, the United States. Savoy is alive and well in Reno, Nevada, though he is just about to set out on yet another sea-faring trans-Pacific adventure in a 20 meter mahogany catamaran with two Mochica dragons as prows. That’s the kind of style lost city discoverers like to travel in no cut-rate economy class for them. Nichols, Fawcett and Randall are dead. Nichols was killed by Indians 25 years ago as he searched for Paititi, a fate suffered by Col. Fawcett half a century earlier. Randall, based for years in Ollantaytambo, died five years ago after being bitten by a dog. 40 kms from Cuzco, in Pusharo, in the jungles of Madre de Dios, there were found petroglyphs covering 14 meters of a massive rock wall, apparently part of a religious complex, thought by some to indicate the existence of a lost city with the characteristics of Paititi. Up-and-comers include Vincent Lee, a Wyoming architect, who is apparently about to produce a book on Vilcabamba. I myself spent part of my early years in Peru looking either for lost cities or for people who had got lost looking for one it’s basically the same thing and I own a hotel in the Sacred Valley which is riddled with ancient cities and an integral part, for sure, of the greatest lost city territory left on Earth. Savoy also helps to explain why it is explorers and not archaeologists who find the lost cities. “Getting into archaeology would have stopped me dead.” he says. “Digging into a pit, messing around with carbon 14 and the other bits and pieces. History, not archaeology, is the key.” Listen carefully, explorers. Savoy is the only man alive who has won the lost city lottery. Three big, big ones, and a score of lesser, excellent finds. At that level we are talking not of gamblers, but of the fellow who owns the casino. Two on my list set off to find El Dorado but never returned. The first was Colonel Fawcett, an eccentric English army officer, a qualified surveyor who among other things fixed a big part of the Bolivia-Peru frontier, and did it so well that it has never been disputed. Colonel Fawcett was doing this at the same time, 1910-11, as Bingham was marching down the Sacred Valley finding Machu Picchu and Rosaspata. Inspired by Bingham’s success, he returned from England in the mid-1920s at the head of an expedition but this time heading, via Rio de Janeiro, for the north-western corner of the Mato Grosso, near the Bolivian frontier. I can’t recall what the logic of his search was, though it was certainly based on stories from locals and Indians he had encountered on his previous travels and surveying. But he disappeared forever and set off a whole school of lost city excitement in England for two or three generations of adventurers who would set off to find both Col. Fawcett and the Lost City that he had presumably found and where he and his son Jack were being held captive in incredible luxury. 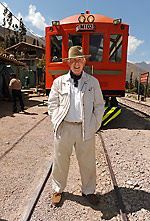 (Another son, Brian Fawcett, lived for years in Peru and was the foremost authority on steam trains in the Andes). In fact Percy Fawcett was killed by Indians in 1925, as proved more or less conclusively by the Villas-Boas brothers, the Brazilian Indian specialists, in the 1950s. The same fate was suffered by my friend Bob Nichols, a tough, unassuming traveler from Oregon. Bob was in his thirties during the 1960s when he spend several years in the Convencion valley, below Cuzco and then in the Alto Madre de Dios jungles at the bottom of the Q’ospipata valley. It’s a tough place today even though a few tourists pass by in powered canoes but it was a really tough place in those days. Bob was an unusually fine writer and got a job with me as a reporter on the Peruvian Times. After a year he told me he wanted to go and find Paititi. His time down in the Madre de Dios had provided him with the inside story, the clues from the indians, whatever. For Bob this last piece of the legend turned out to be unbelievably, tragically true. He, two French friends and half a dozen Mashco Indians set off up the Rio Palatoa from the Dominican mission at Shintuya. They passed the Shinkikibeni petroglyphs. The guides returned, having refused to go on, Bob and the two Frenchmen pressed on. They never reappeared. Many left for El Dorado and never returned. One doesn’t ask questions. Among lost city fans Paititi is the name for a kind of Inca or pre-Inca lost city-state which, in most versions, is still functioning. It is, at least, zealously guarded by impenetrable jungle and impassable ravines as well as by 20-ft bushmasters (shushupes), jaguars and, of course, deadly Indian-guardians. This was 1970. I spent six months looking with no success and no further indication of a Paititi. But two years later a quiet young Japanese law student went in alone and with splendid persistence and courage found, photographed and chatted with three Machiguenga Indians who told him how they had killed the three explorers. They gave him enough bits of paper and other objects to show, beyond doubt, that their story was to be believed. Yoshiharu went back more than once, armed with satellite photographs which showed for this area a series of “dots” apparently in some triangulate alignment. He found nothing but went on to other parts of Peru and produced a super collection of photographs of Peru’s jungle and mountain peoples. Dr. Carlos Neuenschwander, an Arequipa physician, subsequently persuaded the air force to fly into this area, the Pantiacolla range of hills, with a helicopter but found nothing. “Everybody always wants them but you never find anything with helicopters,” says Renato Marin, a Cosquero naturalist and explorer who knows this part of the world better than anyone else. Mr. Marin thinks that there’s a good chance of finding a genuine big city up in the hills behind his former hacienda, Amaybamba, in La Convencion, just downriver form Machu Picchu itself. Two main areas of the mountains and the jungle in Peru are the most consistent producers of ancient cities and fortresses. The classic area is to the north of Cuzco anywhere in an arc from Ausangate to the south and east around through Quincemil and across to the Alto Madre de Dios and Alto Manu and then up towards Atalaya, then back up the western flank of the Apurimac basin towards Ayacucho. Actually, I’d include most of the area north of a line between Cuzco and the northern shores of Lake Titicaca, including the Bolivian frontier region. I’d say that half the world’s lost city people will continue, in my view rightly, to comb this often difficult, outstandingly beautiful, powerfully evocative area with its fine track record. This place smells of lost cities and, why not? lost tribes. Inca roads dive off the highlands into impenetrable jungle and other essentials, including risky, difficult-to-locate Indian groups. Two or three of these have been found within helicopter distance of Cuzco in the past three or four decades. They’ve even attacked oil exploration parties (they didn’t get ’em). The other area is in the North, around Chachapoyas and the great fortress at Kuelap. It’s in this region that Gene Savoy found Gran Pajaten and, later, Vilaya. Savoy also found dozens of other remarkable sites in this area. It was Savoy, too, who located and correctly identified Espiritu Pampa, in the Vilcabamba as the last refuge of Manco Capac and Tupac Amaru. If you think that you will be popular and meet interesting people once you have found a lost city you may be in for a surprise. You might think that your efforts, which undoubtedly provide work for needy archaeologists, would make you respected by them. Not at all. They dislike Savoy intensely and they hated Bingham, the finder of Machu Picchu, Rosaspata and a handful of other world-class ancient remains. Both of them were accused formally of being grave-robbers and huaqueros (people who illegally dig up artifacts and sell them at Sothebys). I myself had to dig Savoy, at that time a reporter for the Peruvian Times, out of clink in Lima on one occasion a quarter of a century ago. This is pure jealously on the part of archaeologists and locals who didn’t have the persistence and perception to get there and stand up and say “I found it!”. Neither Bingham nor Savoy claimed any special academic knowledge. What both of them did was to do a lot of homework, reading the chronicles carefully. They also listened carefully to their guides and travel companions. What Savoy is saying sounds obvious but actually almost no one follows this advice. This is a mistake not made by another branch of lost citying, looking for lost treasure galleons. The winners there comb the records religiously before setting out. This is not at all the style for most lost city searchers. What they all do, I did it myself, is to look at the map and say to themselves and their chums. “This looks like a likely spot. There are no roads, the approaches are dreadful, my friend X’s father’s peon said there is an Inca road that goes straight off that away and he found a golden amulet. Also, it’s not been properly mapped.” (This statement applies to almost all of the area north of Cuzco and the Sacred Valley). A few travelers tales from missionaries easily the most unreliable sources and farmers and hunters rounds out the picture and before long we’re out shopping for Brazilian snake-bite serum, asking how much helicopters cost (too much) and ordering zip-lock plastic bags from Miami. The main basis for thinking that Paititi is off the map is because the Incas are supposed to have thought that the Spaniards were after their last gold hoard and that they ran off with this into the jungle. There may be historical logic to Mr. Angles’s thinking. But it’s not going to cut much ice with the lost city crowd. He himself puts a big “But…” into his own thesis after he describes how the Count of Castelar sent the King of Spain documents, which indicated that the ‘Empire of Paititi’ was at the confluence of the Beni and Mamore Rivers more or less where Percy Fawcett was heading. Those are our marching orders. We must shake the moths out of our mosquito nets! If you though Terra Incognita was only on ye olde maps, take a look at the latest satellite-based charts produced by the Department of Defense (DoD), Washington and the excellent Instituto Geografico Militar, Lima. The DoD (the Pentagon) are the people who can put an Intercontinental Ballistic Missile into the kitchen in the Kremlin, but they haven’t got round to backland Peru. Big slabs of maps within a day’s march of Machu Picchu are blank, with the lame excuse “Not Covered by Aero photographs.” And this is the satellite age. Lost city people, take note and take heart. The DoD people, lost city men for sure, are keeping something back.